Multiple myeloma survivors Nancy Dziedzic, Matt Goldman, Gary Rudman, Terry White and April Jakubauskas bonded to accomplish their goal of climbing Mount Kilimanjaro. 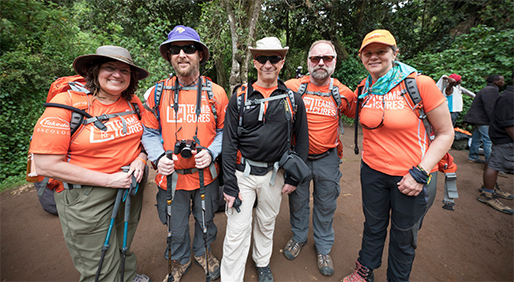 When Nancy Dziedzic first read about a team climbing Mount Kilimanjaro in Tanzania on a multiple myeloma online support group in 2015, she was intrigued, but not sure if it was something she wanted to check off her bucket list. The 51-year-old was living her “new normal” in Sacramento, California, following her multiple myeloma diagnosis in 2014. She had undergone five months of chemotherapy and a stem cell transplant and wasn’t sure if she had the strength to take on this challenge. After watching the 2016 climb closely online, she decided this was an opportunity that she couldn’t pass up. So, Dziedzic applied to participate on the second climb. “I was a little worried it would take quite a bit to get the strength to be able to do it, because I still had some fatigue,” says Dziedzic. “But I decided I needed a goal. Something to shoot for. Something to motivate me.” Dziedzic had just that. She, along with 15 others, were selected to journey to the top of Mount Kilimanjaro in February 2017, which stands 19,341 feet above sea level. The team was made up of six survivors living with multiple myeloma — Dziedzic, Matt Goldman, Mark Herkert, April Jakubauskas, Gary Rudman and Terry White — as well as an oncologist, research professionals and patient supporters. The adventure is part of the Moving Mountains for Multiple Myeloma program, which is a collaboration between CURE Media Group, Takeda Oncology and the Multiple Myeloma Research Foundation (MMRF) to raise awareness and funds for myeloma research. The team members first met one another in July 2016 when they did a practice climb in Colorado. In addition to that training, most of the climbers did hikes or walks, or worked on a Stairmaster or elliptical machine, among other exercises, to help prepare themselves for what was ahead. The climbers didn’t meet again until they were ready to begin their 11-day adventure in Africa. 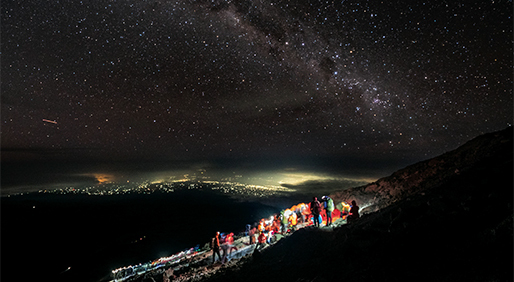 Following a three-hour bus ride on a dirt road to the base of Kilimanjaro, they were off — accompanied by a team of local guides and porters, who led the way, helped carry equipment for camp and provided some much-needed inspiration when times got tough. While Goldman didn’t reach the summit because, as he says, he “ran out of gas,” he felt that what he did endure exceeded his expectations — not only the climb, but the people, too. That is one aspect many of the team members can attest to. Rudman made it to Stella point, which is at 18,652 feet, and realized his body was done climbing. On the advice of the team doctor and MMRF staff, he turned back while the others pressed on. 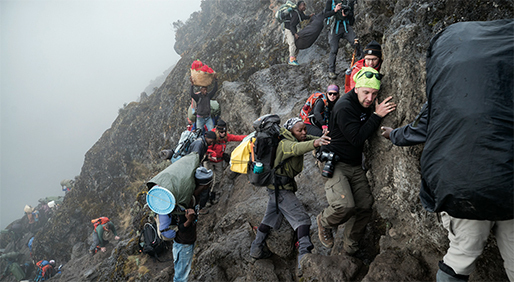 White and Dziedzic were part of the team that made it to the very top — Uhuru Peak. For Goldman, Rudman, White and Dziedzic, their reaction was that this feat was out of reach when they first heard the idea. After participating in the climb, they agree that there is nothing that will keep them from living their lives. “It puts everything into perspective for me for my future,” Dziedzic says. “When you are diagnosed, it’s hard to see the future because you don’t know what is happening. I feel more confident now that my future is going to have a lot of adventures, and that cancer is not going to be stopping me.” As far as other patients who are battling their own mountain, White says, they can overcome this, too. Before the climb, each team member committed to raising at least $10,000 to support the work done by the MMRF in the field of oncology and cancer research. The total goal was $250,000 — and they had exceeded that with more than $256,000 raised. Although multiple myeloma is considered incurable, it is a highly treatable disease with a variety of drugs that can help patients live longer. The blood cancer is often diagnosed in people aged 65 and older, and more commonly in men. The American Cancer Society estimates that 30,280 new cases will be diagnosed this year.